The Holidays are near and we come bearing gifts. The much anticipated My Love Story!! Premium Box Set! Don’t forget that you can get FREE shipping on all April pre-orders through 12/27/16 at 11:59pm CST. We have some fan favorites in here too, so scroll all the way down! Happy Holidays! SYNOPSIS: Takeo Goda's hulking physique and affinity for sports make him popular with other guys, but girls just find him intimidating. Unaware of his gentle nature, the girls that Takeo likes always seem to fall for his handsome best friend, Suna, instead. Takeo is resigned to being Suna's wingman, with no hard feelings between them, until Takeo rescues Rinko Yamato from a molester on the train. 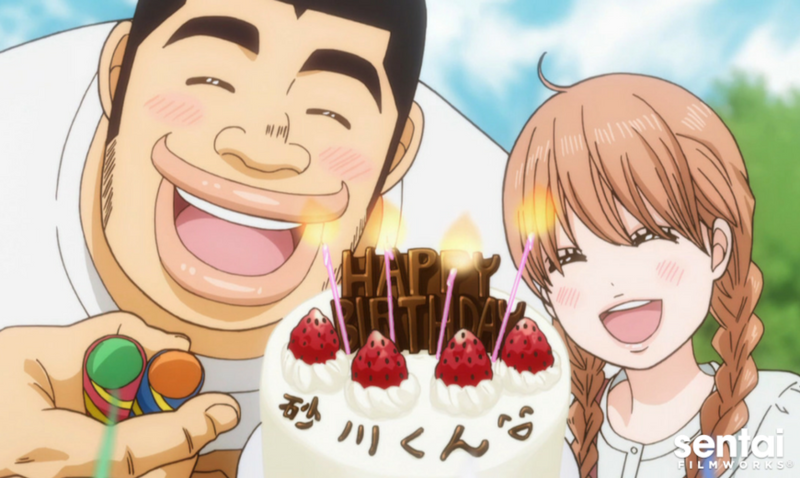 Unfortunately, while Rinko might see past Takeo's brutish appearance, Takeo's become so conditioned to girls preferring Suna that he assumes Rinko is the same! Being the good, genuine guy he is, he's going to do everything he can to help the two of them be happy. Will Takeo let himself believe someone likes him? Love isn't blind: it's just a little dense in MY LOVE STORY! SYNOPSIS: Buntarou Hojo has a gift for envisioning plots and scenarios in his head, but when it comes to imagining a story for his own life, he has a bad case of writer's block. Writing scripts for his high school's drama department has given him a temporary outlet, but when school ends, what's next? Just when Buntarou's future seems its bleakest, classmate Sayuki Kuroda asks him to write for her bishoujo video game development group. Suddenly, all the pieces start to fall together, but as Buntarou and Sayuki recruit more girls (and one romantically challenged guy), they'll find that the path through the wasteland of life is filled with more twists than any game. Expect the unexpected as making a computer-simulated romance becomes a real-world drama in GIRLS BEYOND THE WASTELAND! SYNOPSIS: It’s time to re-open the doors to Rabbit House, where good friends are ready to take on the next exciting adventure, and there’s always something unusual going on. After all, how many cafés have waitresses who collect firearms and a rabbit that actually talks? However, trouble may be burrowing into the Kafu residence when a magazine runs an article on places to eat and neglects to mention Rabbit House! Will an investigation into what’s been “haunting” Syaro’s house be a wild goose chase, or will someone get a lot of grey hare as a result? Is the sudden appearance of Cocoa’s big sister a blessing or a disaster waiting happen? Still, nothing is as scary as the prospect of graduating school! Will everyone make the grade, or will some friends be left behind? The tail will be told as Chino, Cocoa, Rize, and the gang all return in IS THE ORDER A RABBIT? SEASON 2! SYNOPSIS: It's been two years since the International Science Organization and their elite Science Ninja Team strike force defeated the threat of GALACTOR at the cost of Joe the Condor's life. However, there's no time limit on evil, and when Leader X stages a horrific attack on a cruise ship, there's only one force in the universe with a chance of stopping them! Can the Gatchaman team adapt to working with Joe's replacement in time to stop Leader X from mutating one of the victims into GALACTOR's new leader? Or does the ISO have a secret weapon lurking in the wings, ready to help save the day? For the first time, the uncut, uncensored second season of the series that set the standard for Japanese science fiction storms American shores in GATCHAMAN II! SYNOPSIS: From the charred pieces of the corrupt Arcadia Empire, a new kingdom arose. To protect itself from future foes, the Kingdom of Atismata established the Royal Knight Academy to train warriors in the art of fighting with Drag-Rides, ancient mechanical dragons. The Academy has a catch though: it’s strictly a no-male school, and when the former prince of the ruined Empire, Lux, stumbles into the baths, he lands himself in a compromising situation with Lisesharte, the new kingdom’s princess. Understandably upset, she challenges him to a Drag-Ride duel, launching their lives into an explosive chain reaction that will expose the dark secrets of both royal families. Whether Lux is fighting off monsters, corruption, or his female classmates, things are sure to take flight into the unpredictable skies in UNDFEATED BAHAMUT CHRONICLE. SYNOPSIS: Where is he? More importantly, who is he? Awakening in a frozen wasteland, his first memories are of danger as he is instantly attacked by a giant creature. Kuon, the cat-like girl who rescues him, doesn't know who he is either, but she gives him the name Haku in honor of another mysterious stranger who came to this world. Now, Haku must quickly learn how to survive in a land where monstrous beasts prowl, and where half-human beings rule in a city riddled with intrigue and secrets. With armies to aid, Princesses to guard, and a whole new future to explore, Haku and Kuon will face truth after shocking truth in UTAWARERUMONO: THE FALSE FACES!